The Manpower on Wheels (MOW) first rolled out in 1993 as a mobile laboratory training school providing free employable skills training to help uplift the lives of the poor and the needy residents of Las Piñas and Muntinlupa. MOW is a joint project of the Villar SIPAG and the Technical Education and Skills Development Authority (TESDA). 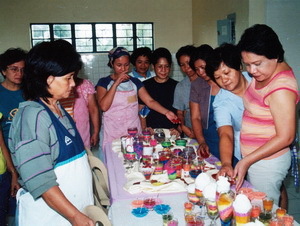 In 2001, MOW went nationwide as the Sipag at Tiyaga Caravan Kaalaman. Caravan Kaalaman is a livelihood seminar program of the Villar SIPAG. seeking to provide housewives and out of school youth nationwide skills training the skills necessary help them become micro entrepreneurs and generate income for their families. Since 2001, the Caravan has been to all provinces and regions in the country and has equipped many Filipinos with worthwhile skills. The courses offered include: meat processing native kakanin-making, candle making, fruit juice processing and preservation, fish processing, coconut processing, condiments making, pickled products processing, sasso chicken growing, herbal medicine processing and Soya products processing among others. On special request, training in water hyacinth (“waterlily”) basket and slippers making is also offered. This program believes that the best way to help the poor fight poverty is by providing them the skills and access to resources and materials to start their own business. Transforming idle human resource into productive entrepreneurs is a clear path towards achieving economic independence.